Turning different system settings and other features on and off using toggles has always been an important part of the iOS experience. 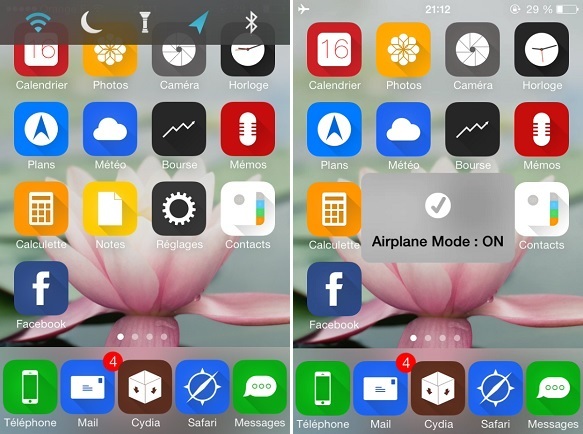 With the addition of Control Center turning switching toggles became even easier although such solutions have always been available to jailbreak users in the form of SBSettings and NCSettings tweaks. If you are not a fan of ControlCenter’s toggle menu then there’s a new hack called TouchBar, which brings a similar toggle bar to iOS 7’s status bar. The TouchBar tweak features the same options as ControlCenter that includes toggles for WiFi, Do Not Disturb mode, torch, location services and Bluetooth. TouchBar can be accessed by performing an Activator gesture assigned by the user. When you tap on a toggle you are shown a notification that the setting has been turned on or off. The toggle menu that looks very similar to iOS 6’s NCSettings tweak (made obsolete by CC) turns the button blue for settings that have been turned on while those that are off are turned white. You can get this tweak from Cydia’s ModMyi repo for $0.99.